Recent Arrival! 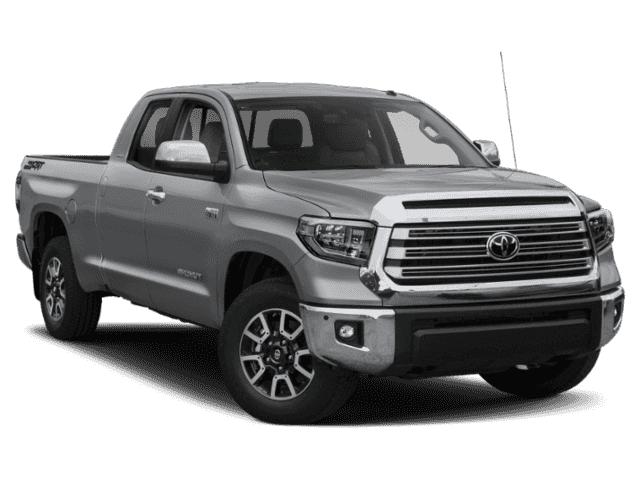 4WD 2019 Toyota Tundra SR5 SR5 i-Force 5.7L V8 Flex Fuel DOHC 32V LEV Magnetic Gray Metallic REAR BACK UP CAMERA, BLUETOOTH, **STEERING WHEEL MOUNTED AUDIO CONTROLS**, 4WD, Graphite w/Fabric Seat Trim, *Convenience Package*, 38 Gallon Fuel Tank Capacity, Anti-Theft Immobilizer w/Alarm, Bedside TRD Off Road Decal, Blind Spot Monitor w/Rear Cross Traffic Alert, Brake assist, Color-Keyed Rear Bumper, Fabric Seat Trim w/TRD Off Road Package, Front & Rear Parking Assist Sonar, Front Bucket Seats, Illuminated Entry System, LED Headlights w/Smoked Housings, Rear Under-Seat Storage Compartment, Sliding Rear Window w/Privacy Glass, SR5 Upgrade Package, Trail-Tuned Bilstein Shock Absorbers, TRD Off Road Floor Mats, TRD Off Road Package, Urethane Tilt/Telescopic Steering Wheel, Wheels: 18" x 8J Split 5-Spoke TRD Off Road Alloy, Wide Angle LED Front Fog & Driving Lights. Proudly serving Elizabethtown and all of Kentucky for over 60 years! Call 270-737-2181 or (800) 999-7591 to schedule a test drive today. All prices plus tax, title, lic, and dealer processing fee. 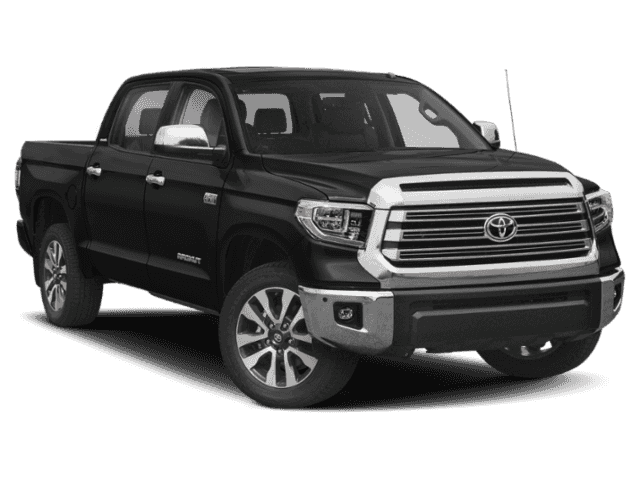 4WD 2019 Toyota Tundra Limited Limited i-Force 5.7L V8 DOHC 32V LEV Gray REAR BACK UP CAMERA, NAVIGATION/GPS/NAV, BLUETOOTH, **STEERING WHEEL MOUNTED AUDIO CONTROLS**, 4WD, Black w/Leather Seat Trim (LE), Bedside TRD Off Road Decal, Blind Spot Monitor w/Rear Cross Traffic Alert, Color-Keyed Rear Bumper, Front & Rear Parking Assist Sonar, Glass Breakage Sensors (GBS), Illuminated Entry System, Leather Seat Trim w/TRD Off Road Package, Limited Premium Package, Navigation System, Power Windows w/Front Auto Up/Down. Proudly serving Elizabethtown and all of Kentucky for over 60 years! Call 270-737-2181 or (800) 999-7591 to schedule a test drive today. All prices plus tax, title, lic, and dealer processing fee. 4WD 2019 Toyota Tundra SR5 CrewMax SR5 CrewMax i-Force 5.7L V8 DOHC 32V LEV Super White REAR BACK UP CAMERA, NAVIGATION/GPS/NAV, BLUETOOTH, **STEERING WHEEL MOUNTED AUDIO CONTROLS**, !! !2YR/24,000 COMPLIMENTARY MAINTENANCE PLAN INCLUDED!! 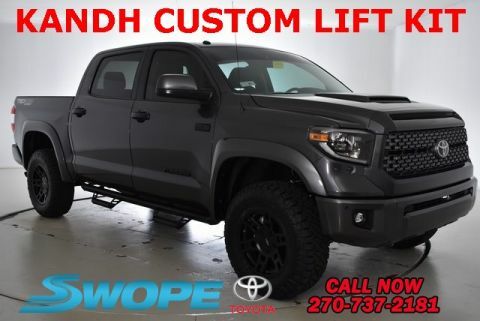 !, 4WD, Graphite w/Fabric Seat Trim, 38 Gallon Fuel Tank Capacity, Anti-Theft Immobilizer w/Alarm, Bedside TRD Sport Decal, Dark Gray Honeycomb-Style Grille, Fabric Seat Trim w/TRD Off Road Package, Fabric Seat Trim w/TRD Sport Package, Front Bucket Seats, LED Headlights w/Smoked Housings, Power Heated Exterior Mirrors, Sport-Tuned Suspension, SR5 Upgrade Package, TRD Front & Rear Anti-Sway Bars, TRD Shift Knob, TRD Sport Floor Mats, TRD Sport Package, TRD-Tuned Bilstein Dampers, Urethane Tilt/Telescopic Steering Wheel, Wide Angle LED Front Fog & Driving Lights. Proudly serving Elizabethtown and all of Kentucky for over 60 years! Call 270-737-2181 or (800) 999-7591 to schedule a test drive today. All prices plus tax, title, lic, and dealer processing fee. 4WD 2019 Toyota Tundra SR5 CrewMax SR5 CrewMax i-Force 5.7L V8 DOHC 32V LEV Super White REAR BACK UP CAMERA, NAVIGATION/GPS/NAV, BLUETOOTH, **STEERING WHEEL MOUNTED AUDIO CONTROLS**, 4WD, Graphite w/Fabric Seat Trim, *Convenience Package*, 38 Gallon Fuel Tank Capacity, Anti-Theft Immobilizer w/Alarm, Bedside TRD Off Road Decal, Blind Spot Monitor w/Rear Cross Traffic Alert, Color-Keyed Rear Bumper, Fabric Seat Trim w/TRD Off Road Package, Front & Rear Parking Assist Sonar, Front Bucket Seats, LED Headlights w/Smoked Housings, SR5 Upgrade Package, Trail-Tuned Bilstein Shock Absorbers, TRD Off Road Floor Mats, TRD Off Road Package, Urethane Tilt/Telescopic Steering Wheel, Wheels: 18" x 8J Split 5-Spoke TRD Off Road Alloy, Wide Angle LED Front Fog & Driving Lights. Proudly serving Elizabethtown and all of Kentucky for over 60 years! Call 270-737-2181 or (800) 999-7591 to schedule a test drive today. All prices plus tax, title, lic, and dealer processing fee. 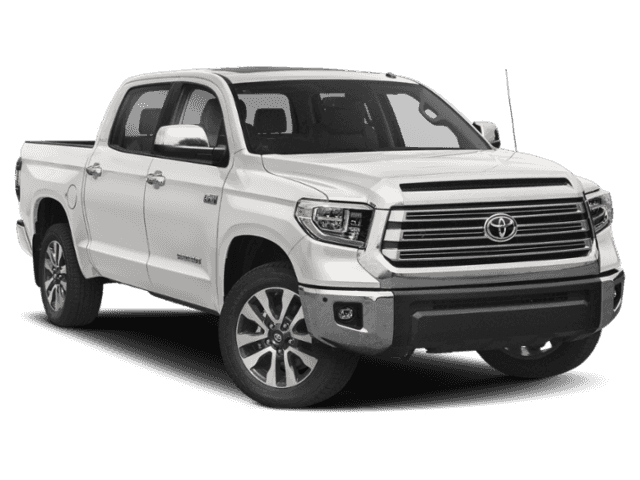 4WD 2019 Toyota Tundra SR5 CrewMax SR5 CrewMax i-Force 5.7L V8 DOHC 32V LEV Super White REAR BACK UP CAMERA, NAVIGATION/GPS/NAV, BLUETOOTH, **STEERING WHEEL MOUNTED AUDIO CONTROLS**, 4WD, Graphite w/Fabric Seat Trim, *Convenience Package*, 38 Gallon Fuel Tank Capacity, Anti-Theft Immobilizer w/Alarm, Bedside TRD Off Road Decal, Blackout Emblem Overlays, Blind Spot Monitor w/Rear Cross Traffic Alert, Color-Keyed Rear Bumper, Fabric Seat Trim w/TRD Off Road Package, Front & Rear Parking Assist Sonar, Front Bucket Seats, LED Headlights w/Smoked Housings, SR5 Upgrade Package, Trail-Tuned Bilstein Shock Absorbers, TRD Off Road Floor Mats, TRD Off Road Package, Urethane Tilt/Telescopic Steering Wheel, Wheels: 18" x 8J Split 5-Spoke TRD Off Road Alloy, Wide Angle LED Front Fog & Driving Lights. Proudly serving Elizabethtown and all of Kentucky for over 60 years! Call 270-737-2181 or (800) 999-7591 to schedule a test drive today. All prices plus tax, title, lic, and dealer processing fee. Recent Arrival! 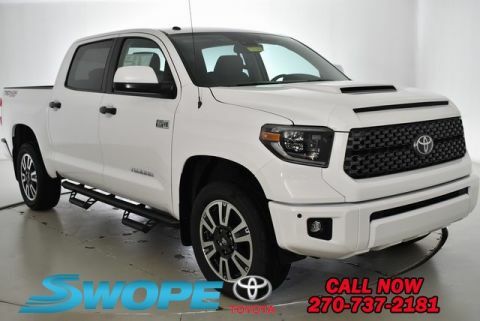 4WD 2019 Toyota Tundra SR5 CrewMax SR5 CrewMax i-Force 5.7L V8 Flex Fuel DOHC 32V LEV Super White REAR BACK UP CAMERA, NAVIGATION/GPS/NAV, BLUETOOTH, **STEERING WHEEL MOUNTED AUDIO CONTROLS**, 4WD, Graphite w/Fabric Seat Trim, 38 Gallon Fuel Tank Capacity, All Weather Floor Liners, Anti-Theft Immobilizer w/Alarm, Bedside TRD Sport Decal, Blind Spot Monitor w/Rear Cross Traffic Alert, Carpet Floor Mats & Door Sill Protector Package, Dark Gray Honeycomb-Style Grille, Exterior Parking Camera Rear, Fabric Seat Trim w/TRD Off Road Package, Fabric Seat Trim w/TRD Sport Package, Four Season Floor Mat Package, Front & Rear Parking Assist Sonar, Front Bucket Seats, LED Headlights w/Smoked Housings, Power Heated Exterior Mirrors, Sport-Tuned Suspension, SR5 Upgrade Package, TRD Front & Rear Anti-Sway Bars, TRD Shift Knob, TRD Sport Convenience Package, TRD Sport Floor Mats, TRD Sport Package, TRD-Tuned Bilstein Dampers, Urethane Tilt/Telescopic Steering Wheel, Wheels: 20" Premium 6-Spoke Alloy, Wide Angle LED Front Fog & Driving Lights. Proudly serving Elizabethtown and all of Kentucky for over 60 years! Call 270-737-2181 or (800) 999-7591 to schedule a test drive today. All prices plus tax, title, lic, and dealer processing fee. 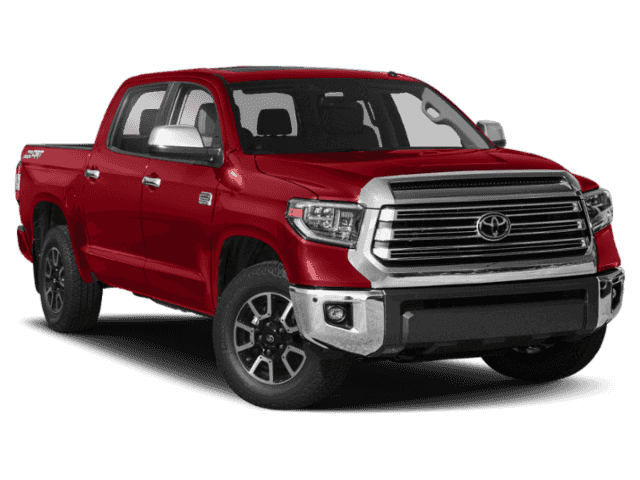 4WD 2019 Toyota Tundra Limited CrewMax Limited CrewMax i-Force 5.7L V8 DOHC 32V LEV Barcelona Red Metallic SUNROOF/MOONROOF, REAR BACK UP CAMERA, NAVIGATION/GPS/NAV, BLUETOOTH, **STEERING WHEEL MOUNTED AUDIO CONTROLS**, 4WD, Sand Beige w/Leather Seat Trim, Bedside TRD Off Road Decal, Blind Spot Monitor w/Rear Cross Traffic Alert, Color-Keyed Rear Bumper, Entune App Suite, Front & Rear Parking Assist Sonar, Glass Breakage Sensors (GBS), Illuminated Entry System, Leather Seat Trim w/TRD Off Road Package, LED Headlights w/Smoked Housings, Limited Premium Package, Power Windows w/Front Auto Up/Down, SIRIUSXM Satellite Radio, Trail-Tuned Bilstein Shock Absorbers, TRD Off Road Floor Mats, TRD Off Road Package, Wheels: 18" x 8J Split 5-Spoke TRD Off Road Alloy. Proudly serving Elizabethtown and all of Kentucky for over 60 years! Call 270-737-2181 or (800) 999-7591 to schedule a test drive today. All prices plus tax, title, lic, and dealer processing fee. Recent Arrival! 4WD 2019 Toyota Tundra SR5 CrewMax SR5 CrewMax i-Force 5.7L V8 Flex Fuel DOHC 32V LEV Midnight Black Metallic SUNROOF/MOONROOF, REAR BACK UP CAMERA, NAVIGATION/GPS/NAV, BLUETOOTH, **STEERING WHEEL MOUNTED AUDIO CONTROLS**, 4WD, Black w/Fabric Seat Trim, 38 Gallon Fuel Tank Capacity, Anti-Theft Immobilizer w/Alarm, Bedside TRD Sport Decal, Blind Spot Monitor w/Rear Cross Traffic Alert, Dark Gray Honeycomb-Style Grille, Exterior Parking Camera Rear, Fabric Seat Trim w/TRD Off Road Package, Fabric Seat Trim w/TRD Sport Package, Front & Rear Parking Assist Sonar, Front Bucket Seats, LED Headlights w/Smoked Housings, Power Heated Exterior Mirrors, Sport-Tuned Suspension, SR5 Upgrade Package, TRD Front & Rear Anti-Sway Bars, TRD Shift Knob, TRD Sport Convenience Package, TRD Sport Floor Mats, TRD Sport Package, TRD-Tuned Bilstein Dampers, Urethane Tilt/Telescopic Steering Wheel, Wheels: 20" Premium 6-Spoke Alloy, Wide Angle LED Front Fog & Driving Lights. Proudly serving Elizabethtown and all of Kentucky for over 60 years! Call 270-737-2181 or (800) 999-7591 to schedule a test drive today. All prices plus tax, title, lic, and dealer processing fee. Recent Arrival! 4WD 2019 Toyota Tundra Limited CrewMax Limited CrewMax i-Force 5.7L V8 DOHC 32V LEV Super White SUNROOF/MOONROOF, REAR BACK UP CAMERA, NAVIGATION/GPS/NAV, BLUETOOTH, **STEERING WHEEL MOUNTED AUDIO CONTROLS**, 4WD, Black w/Leather Seat Trim (LE), Bedside TRD Off Road Decal, Blind Spot Monitor w/Rear Cross Traffic Alert, Color-Keyed Rear Bumper, Entune App Suite, Exterior Parking Camera Rear, Front & Rear Parking Assist Sonar, Glass Breakage Sensors (GBS), Illuminated Entry System, Leather Seat Trim w/TRD Off Road Package, LED Headlights w/Smoked Housings, Limited Premium Package, Navigation System, Power Tilt & Slide Moonroof w/Sliding Sunshade, Power Windows w/Front Auto Up/Down, Radio: Entune Premium JBL Audio AM/FM/HD Radio/CD, SIRIUSXM Satellite Radio, Trail-Tuned Bilstein Shock Absorbers, TRD Off Road Floor Mats, TRD Off Road Package, Wheels: 18" x 8J Split 5-Spoke TRD Off Road Alloy. Proudly serving Elizabethtown and all of Kentucky for over 60 years! Call 270-737-2181 or (800) 999-7591 to schedule a test drive today. All prices plus tax, title, lic, and dealer processing fee. 4WD 2019 Toyota Tundra Platinum 5.7L V8 Platinum 5.7L V8 i-Force 5.7L V8 DOHC 32V LEV Midnight Black Metallic SUNROOF/MOONROOF, REAR BACK UP CAMERA, NAVIGATION/GPS/NAV, BLUETOOTH, **STEERING WHEEL MOUNTED AUDIO CONTROLS**, 4WD, Black w/Leather Seat Trim (LE), Power Tilt & Slide Moonroof w/Sliding Sunshade. Proudly serving Elizabethtown and all of Kentucky for over 60 years! Call 270-737-2181 or (800) 999-7591 to schedule a test drive today. All prices plus tax, title, lic, and dealer processing fee. Recent Arrival! 4WD 2019 Toyota Tundra 1794 CrewMax 1794 CrewMax i-Force 5.7L V8 DOHC 32V LEV Barcelona Red Metallic SUNROOF/MOONROOF, REAR BACK UP CAMERA, NAVIGATION/GPS/NAV, BLUETOOTH, **STEERING WHEEL MOUNTED AUDIO CONTROLS**, 4WD, Brown/Black w/Leather Seat Trim (LD), 1794 Grade Package, Blind spot sensor: Blind Spot Monitor (BSM) warning, Navigation System, Power Tilt & Slide Moonroof w/Sliding Sunshade, Turn signal indicator mirrors, Western Grade Package. Proudly serving Elizabethtown and all of Kentucky for over 60 years! Call 270-737-2181 or (800) 999-7591 to schedule a test drive today. All prices plus tax, title, lic, and dealer processing fee. K&H CUSTOMS Upgrade PKG!!!! Includes Bushwacker Fender Flares(Color Matched) - 2.5 Inch Bilstein Lift KIt- Custom Heated Leather Seats, 18x9 FX PRO Wheels wrapped in Nitto Ridge Grappler Off Road Tires and blacked out window tint. Please Call or Email for Availability - We use this as a show truck and could be on display. 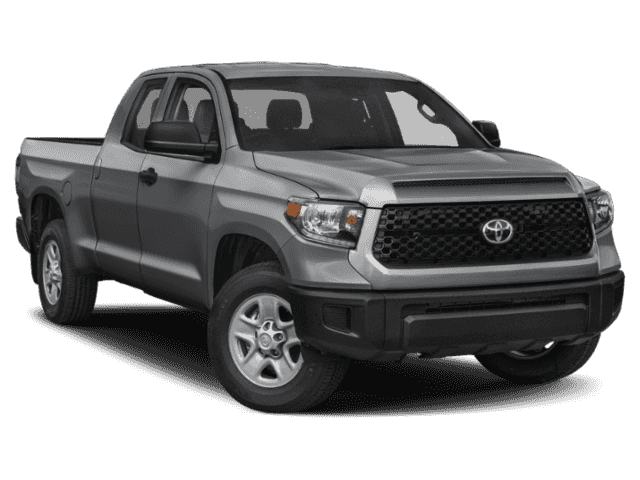 4WD 2019 Toyota Tundra SR5 CrewMax SR5 CrewMax i-Force 5.7L V8 Flex Fuel DOHC 32V LEV Magnetic Gray Metallic REAR BACK UP CAMERA, NAVIGATION/GPS/NAV, BLUETOOTH, **STEERING WHEEL MOUNTED AUDIO CONTROLS**, 4WD, Graphite w/Fabric Seat Trim, 38 Gallon Fuel Tank Capacity, Anti-Theft Immobilizer w/Alarm, Bedside TRD Sport Decal, Blind Spot Monitor w/Rear Cross Traffic Alert, Dark Gray Honeycomb-Style Grille, Fabric Seat Trim w/TRD Off Road Package, Fabric Seat Trim w/TRD Sport Package, Front & Rear Parking Assist Sonar, Front Bucket Seats, LED Headlights w/Smoked Housings, Power Heated Exterior Mirrors, Sport-Tuned Suspension, SR5 Upgrade Package, TRD Front & Rear Anti-Sway Bars, TRD Shift Knob, TRD Sport Convenience Package, TRD Sport Floor Mats, TRD Sport Package, TRD-Tuned Bilstein Dampers, Urethane Tilt/Telescopic Steering Wheel, Wheels: 20" Premium 6-Spoke w/Black Accents, Wide Angle LED Front Fog & Driving Lights. Proudly serving Elizabethtown and all of Kentucky for over 60 years! Call 270-737-2181 or (800) 999-7591 to schedule a test drive today. All prices plus tax, title, lic, and dealer processing fee.